The following are transcripts of two prank calls to European Commission President Jean-Claude Juncker and EU foreign policy chief Federica Mogherini, carried out by Russian prankster duo Alexey Stolyarov and Vladimir Kuznetsov. Stolyarov posed as Armenian prime minister Nikol Pashinyan in both phone calls. Read the full story, including statements from the camps of both Juncker and Mogherini, here. Stolyarov: Good afternoon, president. It’s nice to hear you. Thank you for your call. Stolyarov: I’m really happy. (Laughs) Thank you for the call and I think this is a great holiday for all our country yesterday and today. People are celebrating what happened and here is a big concert on [the] square around our administration, so people are happy and I’m also happy that you called me and yesterday I had a conversation with high representative Mogherini and we discussed many issues regarding our countries so thank you for your support. Juncker: So I wish you all the best. It will be a very difficult task, the one you are facing, and you know it. I am happy that all this process has been dealt with in a very peaceful way. Thank you for that because it was not obvious that it would go without violence so thank you for that. We are celebrating today the Day of Europe so all our offices here are closed apart from me as I’m sitting here, because it’s a public holiday in the Commission so it's a good sign, a good signal that we have this phone conversation - the first one, others will follow - on this European day. When will you present your government? Stolyarov: Let me first of all to congratulate you with this great government holiday and let me answer that I plan to change our government soon, during one month, and I know that it will be meeting on 21st of June, and I hope that our government also could be there and take part there. And you know that we still have big resistance in our country and especially in our parliament, so it’s not easy to change it immediately but I will be on a meeting soon and some of our ministers will be there. Anyway and I also want to tell you thank you for your big role in that process, big role in the EU, and especially because of your support we won and we made our, how to say, rosy revolution in our country. So what about your question we will change our government in one month. Stolyarov: And I also see many issues that I would like to discuss. The first for me, I promised to ratificate a European free trade agreement and all our agreements will be OK. And I also promised to work in a way of free visa regime. I also want to tell you that I am concerned about the situation around Iran’s nuclear deal so it’s a big troubles now and I also wanted to tell you thank you that you did not join Mr Trump. Juncker: Yeah I do think that we have to stick to the comprehensive in our partnership agreement we have concluded. I would like you to do your best efforts to make sure that this is properly implemented. As far as the visa question is concerned it’s maybe too early to start negotiations immediately but my intention is to start negotiations during Monday. We have a certain number of member states, mainly France, being very reluctant to open visa negotiation discussions but it will be done in the next coming year. Because we have to convince France and others, the Dutch, that they have to understand why this is important for your country. So I think that we have a good basis to start our cooperation and I'm ready to do everything i can in order to be helpful to you. Stolyarov: And we are interested in a stable situation in the region. Stolyarov: And now they change our parliament and you know that we had some resistance from Russia, so it was not easy to stay and but now I think it's a stable situation - people elected me, and so I will find many ways how to cooperate with all other countries, and especially with the EU. Juncker: And with Russia, we are not asking to break your relations with Russia. It’s important that you will have a meeting with Vladimir Putin I think on the 14th of May or something like that - that's good. It’s good. He's a personal friend of mine so I can talk with him whenever it's needed. To your intent to organise the next elections, snap elections. Stolyarov: Also I would like to invite you in Armenia, in Yerevan. We can make good Armenian barbeque, which is Shashlik. Juncker: (Laughs)That sounds good too. I will come next year. This year is no longer possible, but next year we will find days and opportunities to visit. Stolyarov: Yeah, I hope that we can make Shashlik on our square, with we can make a meeting. People made Shashlik on the streets so it was a peaceful revolution, we can make it like a symbol. Also I hear, I know that I spoke with Mr Poroshenko - we are friends, he called me last week, like every day it was some strange call, because he asked me about financial assistance. It was strange because our country is smaller than his country, and he advised me to bring you Armenian wine that you love. Juncker: Good idea, good idea. Stolyarov: So did you listen to our singer Serj Tankian, leader of the band System of a Down? Stolyarov: Now is a concert and I want to open a window and let you listen to how people celebrate if you are not against that. Ok.
Juncker: Yeah, I can hear it. Stolyarov: So I will close it. 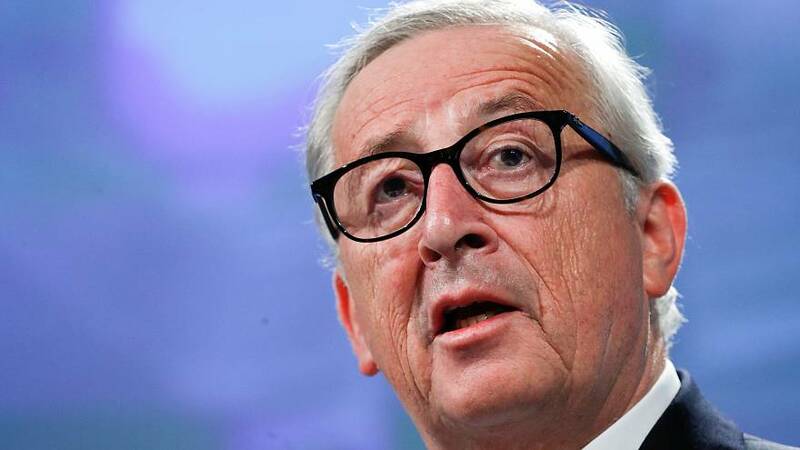 Juncker: Will you address public now? Juncker: If you are delivering speech, give them my kind regards. Stolyarov: Thank you so much, dear president. Stolyarov: Have a nice day. Stolyarov: Hello. How are you there, Your Excellency. Mogherini: Hello, hi, how are you? Stolyarov: I’m good. You know this last news that I’m already prime minister. I’m glad to listen to you and this is my first foreign call. Stolyarov: And I also want to tell you that we all appreciate the role of the EU in our well-wed revolution, as we call it a revolution of love, and we appreciate your investment in our civil society. And you know that now I will change our government and I hope that we will can cooperate together. And I also want to see your view regarding our relations. Mogherini: Absolutely, I know that we have an Association Council planned for the 21st of June so my suggestion would be that we keep it as planned now that Armenia has a new prime minister. I imagine you will proceed with formation of the government rather quickly. At the first opportunity for you to visit France - and obviously you would be welcome to visit anytime at the earliest possible – so we can have a first conversation on our common agenda and our relations. What kind of planning do you have for the formation of the government? Do you think it will take long? Stolyarov: I hope that we will finish in one month. Mogherini: Good. Good. That would be good because again, I think we have our Association Council scheduled for the 21st of June. If you have a government formed by then, that would be a good opportunity to come to Brussels, not only you but also with some ministers so we can have a comprehensive discussion about all the different items on our agenda, from trade to customs to economic reforms and some other things. So that could be a good opportunity. Stolyarov: Of course. Also you know that the problem is also a problem of Karabakh. I also will visit this area tomorrow. And we also want to start our meetings with the authorities of Azerbaijan soon and I also hope for your support. Mogherini: Absolutely, you know that we are supporting the process very much and for us it’s a very important issue. If we, if you manage to move with some positive steps on that for us it will be crucial because obviously having an open issue like that between two of our strategic partners like Armenia and Azerbaijan - they are both important for us - it’s something that obviously is painful. And I know that it is very difficult but I think that with good will and obviously all the support we can give together with the rest of the international community maybe there is some space for advancing in a good direction there. But count on our support on any talks and work you can put in place in the coming weeks and months. I imagine that first you will have to solve some internal tensions and form the government and deal with your parliament, but I appreciate your willingness to have a discussion with the colleagues from Azerbaijan and see how you can proceed on the talks. Stolyarov: Yes, I also met with your ambassador in Armenia, and we discussed our plans, our future plans and we see ways out – how to, what to do with the pressure of other countries. We know that we are surrounded by Iran, by Turkey, by Azerbaijan, and Georgia, so we need to work together and we don’t need to get pressure. And the other pressure is Russia, also. So we need to find out how to cooperate together. Mogherini: Yeah, absolutely. You’re not living in an easy environment but you can count on us for sure for having a friend on which you can count. It’s true it’s a challenging region and again you’re facing different sorts of pressures and challenges but I'm sure that there could be a way to smooth the tensions and try to find cooperative approaches. Count on us anyway every time for discussing and finding a way forward and cooperating very, very closely. Mogherini: Yeah, maybe this is something we can discuss next time we see in person. Mogherini: Do you see any immediate need for sending some messages or doing something at the moment? Mogherini: Our approach, especially in the case of Armenia has been in the recent couple of years that of always interesting and being very consistent on our friendship and partnership and I think that is the reason why we managed to conclude our agreement. But also avoiding creating the narrative of a geopolitical conflict or of confrontation - we don’t like the idea of adding seeds of influence, and that countries and partners we have are forced to somehow choose who they are partners and friends of. We believe that you can be a good partner for the European Union and a good partner for Russia at the same way. So we avoid putting pressure on our side, and obviously we would also like to see that pressure is not put from other sides. And this is something I have discussed a lot of times with Lavrov. And I think that Russia showed a rather positive attitude on the agreements we’ve concluded with Armenia. Exactly because we explained it, also Moscow, not as an offence or threat to them but on the contrary a way to strengthen our partnership with a country that we consider strategic and friendly and an important partner. But we don’t take this as an off-style act towards the Russian Federation and this is the approach I’ve discussed always with your predecessors but also with Moscow. Obviously this also means that there is no, there is nothing in our partnership that can be defined somewhere else. It’s a sovereign country and priorities are determined by yourself. So we never take as good or appropriate interference from outside in our friendship, which is exclusively between us. And I think this is something that they understand in Moscow. Stolyarov: Yes, we understand that too. Also, and you know we don’t want the same situation as there has been in Ukraine because you know that was a very hard situation between the EU and Russia because of Ukraine so we don’t want to be in the middle like that. You know, I knew Petro Poreshenko for a long time, so we knew each other a long time ago. And he called me two days ago and he also asked me about some credit for his country. So I know that the problem around Ukraine now is not easy so we don’t want the same. Mogherini: Absolutely, no. We should handle things very carefully, avoid any kind of developments in that direction but also underlining that Armenia is a country that has the rights to make choices. From our side what is clear is that we are not asking for a sort of exclusive friendship. We know that you can be friends and partners of many, provided you’re free and free to make your choices and your policies - this is our approach. I know it’s not the same approach everywhere but for us it’s very important that you feel this freedom and the space of not having to choose one or the other. I think this is somehow a precondition for a good partnership. But obviously you can count on us because I know that this is not always the same approach that everybody has. But from our side this is the way we see it and you can always count on us to support you - in particular your freedom of choice and of policymaking and orientations. And we will obviously be constantly at your side. But I think it's extremely important to avoid having any kind of potential confrontation or threat, absolutely. Stolyarov: Petro Poroshenko called me and asked me to support sanctions against Russia but we don’t want to plan to put it through our parliament now. You know that is also an important issue. Mogherini: Yeah absolutely, and you know that also on that we are very clear. Stolyarov: OK so we can keep in touch and thank you for your call, thank you for your support. Mogherini: It’s very important that we established this first contact and I’m really looking forward to first of all continuing to keep in touch. Any time that you see or that I see the need or the opportunity to talk on the phone please do. I would always be happy to talk. Stolyarov: So I hope we will meet soon. Mogherini: Absolutely, all the best. I know that you need a lot of strength in these days so I wish you all the best.